Several day-trip Rhine riverboat excursion cruise lines depart from Rüdesheim to the Loreley Valley. Special savings deals on KD make tickets cheaper. Day-trip riverboat cruise excursions on the Rhine River are amongst the top attractions for travelers to Germany. Rüdesheim is one of the most popular destinations with several large cruise lines offering day cruises to see the Loreley Rock, vineyards and castles of the UNESCO World Cultural Heritage listed Middle Rhine Valley. KD (Köln-Düsseldorfer) is the largest day-trip pleasure cruise line on the Rhine and has some of the best discount deals available to make ticket prices cheaper. Local companies Bingen-Rüdesheimer and Rösslerlinie also have many cruises from Rüdesheim to the Loreley Valley as well as in the Rüdesheim-Bingen-Assmannshausen vicinity. Ticket prices between these Rhine cruise lines vary little but good savings can be had for those qualifying for special discounts. Note that return fares are hardly more expensive than one-way tickets. Winter cruises on the Rhine River are very limited but departures from Rüdesheim are often available, especially during the Christmas market advent weeks in December. Although several cruise lines operate from Rüdesheim and Bingen on the Rhine River, cruise prices vary little between the different boat companies. Special discounts offered by the various lines – especially KD – can bring prices down significantly for those who qualify. The easiest way to save on Rhine River day-trip boat cruises is to buy return tickets on the same cruise line. Return tickets are hardly more expensive than the one-way fare but using the train does offer time savings when time is limited. Typical cruise fares on the Rhine River boat cruises from Rüdesheim or Bingen are around (return): €20 (€25) St Goar / St Goarhausen, €27 (€29) Boppard, €40 (€47) Koblenz, €7 (€9), Assmannshausen and €28 (€35) Mainz. The KD Rhine Pass for €31 gives unlimited travel on KD boats for a day. It is very good value for longer cruises and available from various tour operators such as Get Your Guide but not directly from KD itself. The large number of cruises offered by KD and the selection of discounts make it usually the best choice for most travelers. Cruises may be interrupted for sightseeing en route but spell out plans when buying tickets, as separate tickets are often issued for use on different boats. Reservations for individuals are not possible for day excursion cruises but is usually essential for special event cruises. Small groups of 10 or more should make reservations and receive group discounts. Köln Düsseldorfer Deutsche Rheinschiffahrt , usually abbreviated to the more snappy KD (pronounced kah-deh), is the largest day-trip pleasure boat operator on the Rhein. KD boats operate from many cities and towns between Mainz and Düsseldorf. KD boats depart five times per day during the summer cruise season from Rüdesheim to the Loreley Valley (St Goar / St Goarhausen). 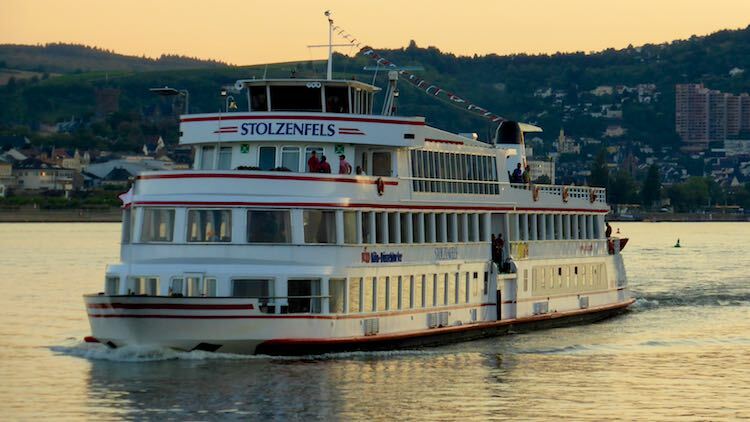 These boats terminate either in Boppard or Koblenz – during the high season, one return journey is made each day on the historic paddle steamer RMS Goethe that has been in operation since 1913. Boat changes in Koblenz make it possible to continue downriver to Bonn. One or two boats per day continue upriver to Mainz but the full Mainz to Cologne Rhine riverboat cruise is no longer offered. 50% off on exact birthday for the birthday child (of any age) and one guest. (See Bingen-Rüdesheimer for wedding anniversary discounts.) Many other lines still honor the free on birthday offer. 50% off for scholars and students under 27. 30% off for seniors over 60 years old. €6 for children 4 to 13 for all cruises. Free for up to 3 children (4-13 years) per accompanying paying adult on Wednesdays. Family tickets for two adults and two children up to 16 – €68 for scheduled cruises (and €28 for panorama cruises in Cologne and Düsseldorf or €26 in Frankfurt). Savings deals cannot be combined for super discounts. Bicycles are transported if space allows on KD Rhine River boats for €2.80 per bicycle per cruise (return is double). Bingen-Rüdesheimer Fahrgastschiffahrt operates the car and people ferry boats between Rüdesheim and Bingen but also day-trip excursion cruises on the Rhine River. Loreleyfahrten – three times a day boats cruise on the Rhine from Rüdesheim to St Goar / St Goarhausen just past the Loreley Rock. Burgenfahrten – up to four times per day these Castle Cruises sail from Rüdesheim, Bingen and Assmannshausen to Burg Rheinstein and Trechtingshausen. This 90-minutes circular cruise pass amongst others Burg Rheinstein, Burg Reichenstein, Ruine Ehrenfels, Mäuseturm and Burg Klopp. Combinations tickets with the cable cars in Rüdesheim and Assmannshausen give small discounts. Rössler Linie operates mostly shorter cruises in the Rüdesheim-Bingen area of the Rhine River with only occasional longer cruises to the Loreley Valley. Rössler’s cruises are similar to the Burgenfahrten of Bingen-Rüdesheimer, as well as the Ringticket combination offer with the cable cars. Vacation Family Ticket (Ferien-Famlien-Ticket) – valid during the school vacation periods of Hessen and Rheinland-Pfalz – €25 for two adults and up to 4 children aged 4 to 16. Rhine River Day-Trip Cruises from Rüdesheim for details on cruises, cruising times and seasons, transportation in the Rhine Valley and getting to Rüdesheim. Deutsche Bahn – English website of German Railways for train schedules and tickets – use Rhein villages with the KD in the name, if available, for an indication how far the boat landings are from the actual train station.